France may have won its first Palme d’Or since 1987 at this year’s Cannes Film Festival, but according to the Italian press the greatest winner was Italian cinema. Dubbed last year as “depressing” by Quentin Tarantino and left out of the main competition, it now seems that Italian movies – at least according to the French festival – are finally getting back on track. Indeed, the grand prix this year went to Matteo Garrone’s Gomorrah while the jury prize was presented to Paolo Sorrentino’s Il Divo. Matteo Garrone’s first film Terra di mezzo won the special jury prize in Turin in 1996. His following films Guests (1998), Estate romana (2000), and The Embalmer (2002) achieved moderate success, and in 2004 he presented First Love at the Berlinale. Gomorrah is adapted from Roberto Saviano’s bestseller and presents a revealing picture of the organized crime network in Naples, the Camorra. Paolo Sorrentino has competed twice for the Palme d’Or, in 2004 with The Consequences of Love and in 2006 with The Family Friend. Il Divo, which refers to Giulio Andreotti, an Italian politician whose career began in 1947 and continues today, paints a controversial portrait of this notorious statesman. While critics around the world praise the courage of the two young filmmakers who exposed these complex and contentious topics, Mr. Andreotti states: “If I could take a share of the profits I’d be even happier.” Both directors commend the Italian government, namely the Ministry of Culture, for the financial support given to their work. 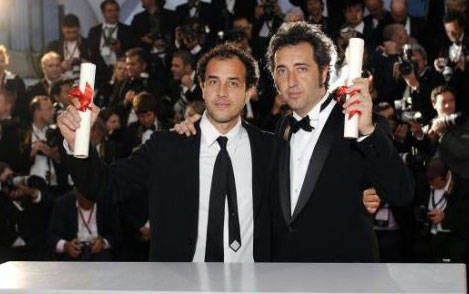 It was the best result for Italian cinema in Cannes since 1972, when two Italian movies shared the Palme d’Or.